Whitewater rafting is an awesome experience—the perfect activity for thrill seekers, team builders, or anyone looking to get up close and personal with nature. However, as with any “extreme” sport, there are a number of misconceptions to accompany the thrills. If you’ve always wanted to try it, but have shied away from booking the trip for any of the following reasons, maybe it’s time to finally take the plunge. Read on for a thorough debunking of four popular whitewater rafting myths. While there’s no way to guarantee absolute safety on a rafting trip, the truth is that the risks are fairly minimal when compared to other outdoor activities. Horseback riding and cycling, for example, both have higher incidents of injury than whitewater rafting. That said, it’s important to pay close attention to the safety briefing before heading out on the river, and to wear the provided protective gear (personal flotation device and helmet) at all times. You have to wear a Helmet in case you fall overboard. First-timers might be interested to learn that not all companies require helmets, but it’s a good idea to wear one anyway. This isn’t just in case of “unscheduled swims,” the term the guides often use to refer to overboard incidents. 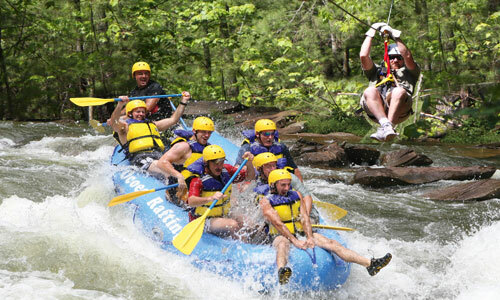 In fact, you’re more likely to get conked on the head by a fellow rafter’s paddle than anything else, which is why some whitewater resorts make the helmet a mandatory aspect of the experience. It’s an experience meant exclusively for adrenaline junkies. Whitewater rafting is undoubtedly exciting, but that doesn’t mean it can’t be enjoyed by the average outdoor-sports enthusiast. Children as young as 5 are permitted on some of the shorter and tamer excursions, and there are specially outfitted rafts available for participants who aren’t capable of wielding a paddle themselves. Note that the rapids are ranked on a scale of I to V, with I meaning a smooth, fairly flat current, and V meaning intense, full-blown whitewater. If you’re thinking of booking a rafting trip, but you want to try a more relaxing experience for your first time, look for a designation no higher than Class III. The Food provided on these Trips is minimalist at best and disgusting at worst. If you’re expecting to suffer through meals of cold canned beans and brown bread, you’re in for a surprise. Whitewater rafting companies know that the competition is fierce, and strive to offer guests the best possible experience. The rapids are going to be pretty much the same no matter which outfit you choose, so they have to focus on variables that they can control—and food is often a number-one priority. Grilled salmon, steak teriyaki, and chicken Caesar wraps are just a few of the options on the menu at some East Coast resorts. Overnight trips feature hearty egg-and-sausage breakfasts, as well as fruit, yogurt, and granola. Guests are usually offered a choice of protein for lunch and dinner, so vegetarians need not worry about being stuck with eating only side dishes. Likewise, if anyone in your party has special dietary needs or restrictions, inform the trip organizers well in advance—it’s too late to make changes once the trip is under way.